The competition may have grown over the years, and VMware may not enjoy quite as large a lead as it once did — but it still enjoys a lead. With useful improvements to a number of key features, as well as the bundling of functions such as backup and recovery that were previously available separately, vSphere 6 is a worthy addition to the vSphere line. That said, some of the major advances in this version, such as long-distance vMotion, will matter most to larger vSphere shops. 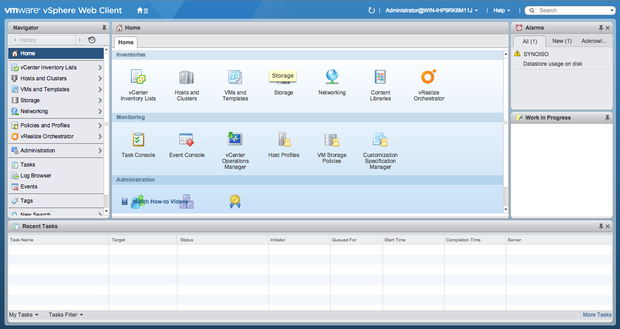 The vSphere Web Client’s right-click context menus are still sluggish at times, but overall faster than before. The first version of the vSphere Web Client was slow, incomplete, and not nearly as fluid as the Windows client, and many users simply refused to work with it. In vSphere 5.5, we saw improvements to the Web client, but it still wasn’t quite to the level of the stand-alone client. In vSphere 6, further usability and speed improvements make the Web client more palatable, as does the addition of support for a broader range of client browsers and operating systems. The client integration tools that allow for important features like VM console access are now available for more platforms, including Mac OS X.
There’s no mistaking the fact that VMware continues to hold the leadership role in server virtualization, but as the feature sets of the top vendors continue to converge and competing solutions continue to get more robust, we may see more of this feature bundling and simplified licensing in the future. For now, vSphere 6 maintains its place as the cream of the crop. This article, “First look: VMware vSphere 6 keeps its edge,” originally appeared at InfoWorld.com. Article written by Paul Venezia. For the latest business technology news, follow InfoWorld.com on Twitter.